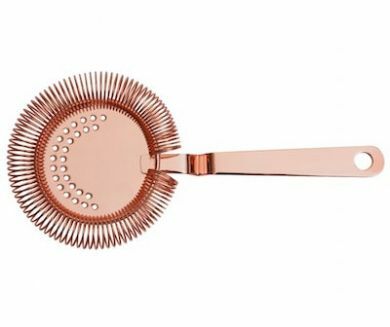 The Mezclar copper plated strainer has a tightly coiled spring which will stain out pips, ice and peel. It is made from heavy gauge stainless steel - ready for constant professional use. The strainer has been designed to fit standard shakers and creates a snug fit for 360Deg filtration. Fits a standard Boston glass. Tightly wound metal spring for efficient ice filtration. The strainer has no supporting prongs due to the superior spring used.